Rip BD/DVD to Apple TV/ATV 2/Apple TV 3 supported H.264/MPEG-4 .mp4 on Mac. Convert/compress BD/DVD to iPad, iPad 2, the New iPad, iPhone 4, iPhone 4S, iPod, etc. Pavtube Blu-ray to Apple TV Converter for Mac is specially designed for Mac users to rip/convert/compress Blu-ray and DVD movies to H.264 and MPEG-4 encoded MP4 files for playback with Apple TV, Apple TV 2 and Apple TV 3. The program also comes with format presets for other popular Apple devices, like iPad/iPad 2/the new iPad, iPhone/iPhone 4/iPhone 4S, and iPod/iTouch 4. Pavtube Blu-ray to Apple TV Converter for Mac could directly rip Blu-ray and DVD movies from discs, IFO files and ISO image files. 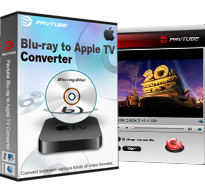 Pavtube Blu-ray to Apple TV Converter for Mac offers format presets for almost all hot Apple devices, including Apple TV, Apple TV 2, Apple TV 3, iPad, iPad 2, the new iPad, iPhone, iPhone 3G, iPhone 4, iPhone 4S and iPod. Pavtube Blu-ray to ATV 3 Converter for Mac adopts advanced encoding technology to speed up the conversion speed. The conversion speed is 1.5 or 2 times faster than other similar tools. The Mac BD to Apple TV Converter enables users to select desired audio track and subs track to be kept in the output files, including forced subtitles. The Blu-ray to Apple TV 3 Converter for Mac offers powerful editing functions, such as trimming and cropping, watermarking, adjusting special effects, replacing audio, deinterlacing, and more. The Blu-ray to Apple TV Converter for Mac allows users to select their needed titles and chapters in a BD/DVD movie to convert at will, so as not to have all the unwanted files. Pavtube Mac BD to ATV 3 Converter supports adding different watermarks to the output videos, including text watermark, image (including GIF) watermark, and video watermark, which enables you to experience the picture-in-picture effect in a better way.